Before I say anything else, I am so grateful to the support I am getting from you out there. I have had some lovely messages of support. Thank you. It helps. I don’t know whether it is the messages that I have been getting, but today seemed easier somehow. I decided not to go to church this morning, so I had all morning to organise things before my husband returned. I wrote lists – in detail and have been ticking off every small element as I go along. I can actually see that I have managed some things and I know what I have left to do. I have finished the information sheets and have printed them out. But I still have to mount them on board ready to go. All my labelling is designed and printed. That too is ready to be mounted on board. But it is a very fiddly job as I found out last time – better to use double-sided tape than glue. I will be taking some limited edition prints with me. They are printed and just waiting to have mounts put on them. I also did a combi-sheet of the different blooms from each Malus variety. I tried it out with the apples and also one for the dissections – but they didn’t look so nice. Too much information on one sheet. I will take some ‘Blossom’ sheets with me, but they aren’t limited edition and won’t be mounted. I have been going on about how different the blossom is on each tree and you can really see it with this page. Guess who’s doing the ironing? And making supper? I am lucky aren’t I? Another thing that has helped today is that I haven’t looked at the pictures at all. This time I am going to show you the Malus x atrosanguinea ‘Gorgeous’ apples. They are of course in coloured pencil. If you don’t know their actual size, you would think they are just ordinary apples. 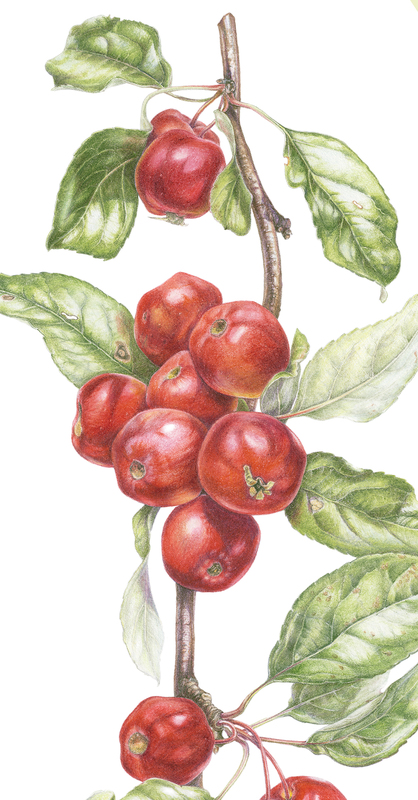 In actual fact, they don’t taste as sour as the other crab apples and there are usually loads on the tiny tree. < 4 days until the set-up for the RHS botanical art exhibition. Hei Denise, thank you. I was in fact thinking of you yesterday as I went through the pictures from last time. I also remember your encouragement when we were in Pittsburgh, about getting into vellum. My husband has bought me some so once this is over I will have a good go with that. Good luck Gaynor – looking forward to seeing you and your work in a few days time! It takes so much time to prepare doesn’t it?! – But it most certainly is worth the trouble. Hei Jessica, thank you very much- and good luck to you too when demonstrating. I am really looking forward to watching you.